1 Getting Started on Voobly! The staff at Voobly are excited to announce the release of a major update for Age of Empires II: Age of Kings. 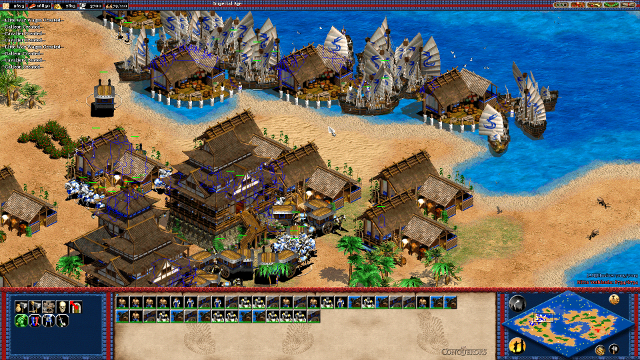 Voobly's new Aok 3.0 patch will greatly improve the balance and game play of the Age Of Empires II: Age of Kings. The updates of Aok 3.0 are focused on creating a better overall gaming experience for all of the Aok community. We have focused on updating areas that will encourage a more balanced gaming platform while also adding some much needed features to this great classic game. 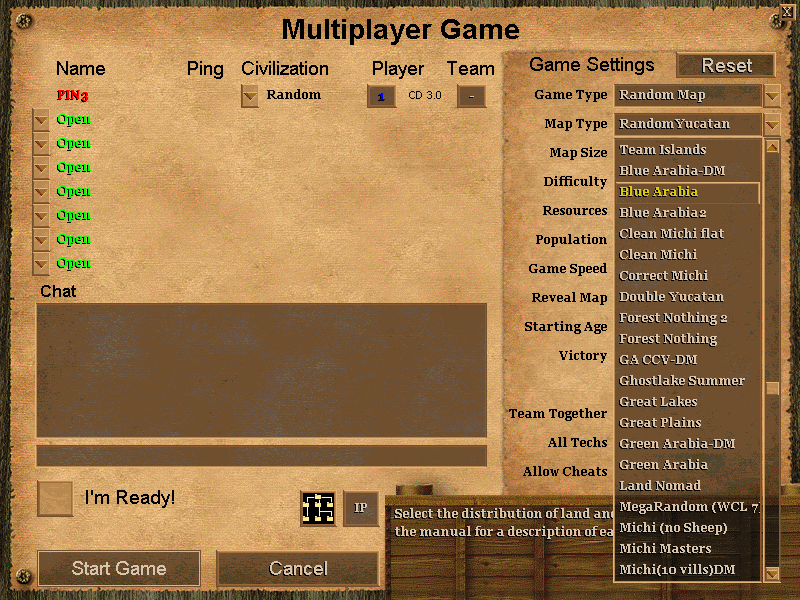 Random Map Scripts - Voobly's Random Map Scripts(RMS) support has now added new custom maps to Age of Empires II: The Age of Kings. Custom maps have been very popular in the AoC community since it's release, but now it is possible to enjoy these custom maps in AoK also. Download the Custom Random Maps Here. Widescreen - Voobly provides full widescreen support to all Aok user's, to enable widescreen in your game room click on "Game" and select the "Resolution Tool" and click on "Force Desktop Resolution in Game". More info here. Now it is possible to choose the position(center,left,right,stretch) of your Command Bar(mini map, unit controls) at the bottom of your screen. At the top of your game room click [Game>Resolution Tool>Command Bar Position] and select where you want your Command Bar positioned. For complete information about Widescreen 2.0 read Here. Multiple Monitor Support - If you have multiple screens you can now enable the multi-monitor support on Voobly and the game will span across all your screens. The only requirement is that you set your the monitor on the left as the primary display within Microsoft Windows display settings. To enable multi-monitor select "Span Game Across Multiple Monitors" from the resolution tool menu: for complete information about multi-monitor support read here. Colored Game Chat - Now your chat in the game will appear the same color as your player color, e.g. if your color is blue your game text will be blue. Also the score colour above the mini has been made more clear and easier to read. 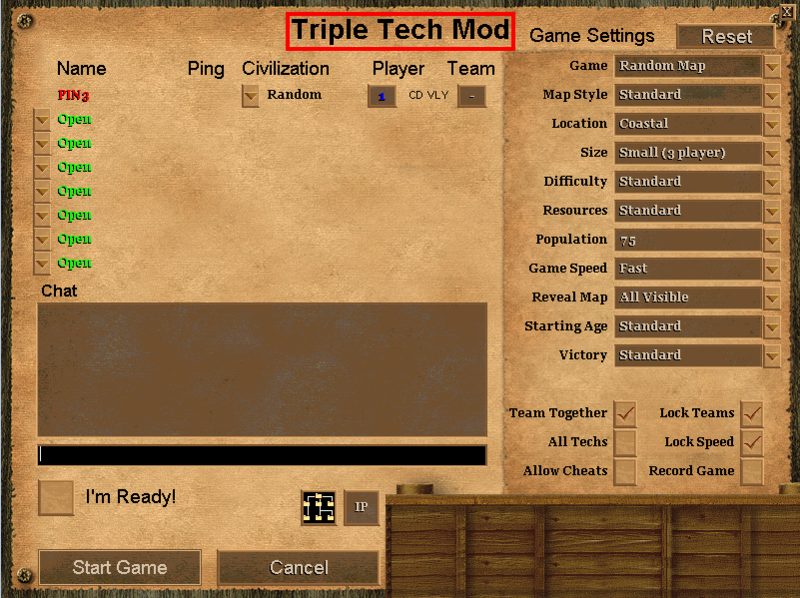 With the amount of quality mods in production such as Tales of Middle Earth and Age of Empires II: Forgotten Empires Voobly decided to improve it's game mod support to make it as quick and easy as possible for users to install and play their favourite game mods. Enhanced Terrains - Enhanced Terrain mod for AoK, this mod updates the grass, water and dirt terrains. Also compatible with other popular graphical mods, such as Small Trees and Bamboo Lovers. Small Trees - Replaces original tree graphics with smaller images, providing much better overview of the map (easier to see units/buildings behind the woods) for easier playing. Maybe some won`t like it because it ruins the "feeling" a bit, making trees almost the same height as villagers. Many of the best players use this "mod" (modification) for improving their play. No Desert - This mod slightly modifies desert terrain, changing dirt to grass. For example, Arabia map terrain looks like Green Arabia. It does not change the color on the minimap, though. Bamboo Lover - This mod replaces all trees with bamboo graphics. All tree shadows except bamboo shadows deleted for clarity. AoK CBA Hero - Cba Hero v6 is a mod for the Age of Kings, it changes the Bombard Towers attack so it no longer destroys rams, adds the Heros, Harold Hardraade and Charles Martel from Aoc, allowing Cba Hero to have the same gameplay as Cba Hero for Aoc. You will need to use the mod with the - =V= AOK CBA Hero map. For further information about using game mods read Here. The Voobly Client comes with 3 different theme styles Voobly Classic, IGZ Classic and Voobly Primitive. With a wide selection of user made themes available for users to download or you can even design your own. For more information about user made themes visit here. Game Ratings are set on specific ladders according to each game type, (e.g. Random Map ladder is for Random Map games), to select the correct rating ladder for your game type simply click on the "Settings" button in your game room and check the box beside "Rated Game" then use the drop down menu to select the correct Rating Ladder and press Ok.
Voobly's Instant Messenger allows you to easily interact with other users by sending messages or inviting them to your room for a game. NAT Traversal 2.0 removes the requirement for users to manually forward ports (though it might be recommended in rare circumstances) and allows multiple LAN players to easily play in the same game room. For more information it's recommend you visit the NAT Traversal Page. Advertise your games or just chat with other users in Voobly's Lobby Chat which includes custom fonts, size and colors with over 100 emoticons. In your user profile you can see your ratings and game history graphs that allow you see your progress over time. The ratings graph shows your rating history and now allows you to compare your progression with other users. Each rating ladder is represented by a colored line so you can compare your rating history on each game ladder you play on. For more information about user rating graphs read here. You can view each rating ladder you have played in through your profile. Each game type has it's own rating ladder and a ranking for every player. It is also possible to see specific stats for the games you have played, e.g. civilization stats, map stats, and recently played matches. If the match was recorded it is possible to download the recorded game from the match by clicking the "Download Rec." option from the player of your choice. For more information on game stats read here. For more information about Customizing your Team read Here. Live streaming can now be shared on your Voobly profile page. Users can now broadcast any game they play on Voobly and other users can watch it live on their profile. For more information about live streaming read here.